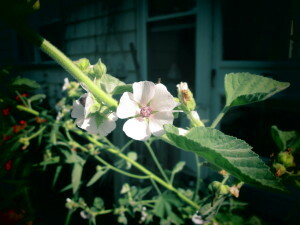 Marshmallow plant is one of our favorite, it’s beautiful and useful. Calendula and Marshmallow infused coconut and olive oil (both organic) are the blended with Shea Butter and a bit of local beeswax. Calendula is used to soothe dry, chapped skin by moisturizing and promoting the growth of new skin cells. It is also used to heal wounds, treat burns and clear up minor infections. My original intention was to use this hand-crafted oil in my First Aid Salve, but I wanted something a little milder, for people looking to clear up minor rashes. Calendula packs a punch, but in a soothing way, which makes the moisturizer good for long term use. Marshmallow is another soothing, gentle herb with anti-inflammatory properties. Marshmallow has been used to treat persistent skin rashes due to eczema, psoriasis, boils and skin ulcers. Like calendula it’s safe for sensitive skin, making it a great healing choice for long term use.